Over the past almost 45 years, since September 1971, we have collected a mass of information on Glengarry people and their ancestry. This includes my Fraser, MacDonalds of Loup, MacDonells of Lundie ancestry lines, and many other local families. The foundation of this work is based on the MacDonald of Loup chart I have, Fr. John MacDonalds Diary of Deaths 1819-1866 and the local Church BMD, mainly from St Raphael's and St Finnan's for the earlier stages. Obits in the Glengarry News has likewise been very helpful over the years. This project, using the above mentioned foundation, starting with Somerled ca 1100, comes down to the present in a variety of sketchy lines. It is growing in a spiral direction. As families crop up, fit in, they are added to these spiral results. This is leading this project in all directions. The beginning of the MacDonalds of Loup, ca 1240, are at least 3 generations older than the start of the Clan Ranald, ca 1386, -- see this connection chart in the family notes folder in family charts named Clan Ranald Loup Connection. In this work I am working to systematically go through each of our many binders of information. Where possible that information is being accompanied by complete church records of Baptisms, Marriages, deaths, references from Fr John Diary of Deaths, obits, commentaries, newspaper clippings where relevant and so on. This work is being done with the REUNION ancestry program for the MacIntosh. When a version is completed, they are saved as web cards so that from the CD anyone can access this information with their favourite web browser starting with the .INDEX. This version of Alex W Fraser’s MacDonalds of Loup, Lundie, Fraser line is Version 5 containing 34,034 entries plus background copies of some additional, confirming documentation, some photos in the folder Family Notes. As I go through this mass of information, I will be scanning a lot of material, in time that will also be part of the results. Do not expect everything to be perfect or complete. I am looking at this from my perspective & you are doing the same from your end, thus, there will always be 2 or more views of the same information to puzzle over. This version is the foundation, as this project continues to develop, it will get fine tuned so that how, where to access the info will be easier to find and glitches reduced. B] John MacDonald brother of Martin MacDonald of Nova Scotia. These 2 Martins are tentatively the same person. This John, brother of Martin, came to Glengarry circa 1788-90, met up with his bride to be, apparently got married at St Raphaels or St Regis or elsewhere, tentatively was the ancestor of John Sandfield MacDonald of St Raphaels and others. Peter sent some references which didn't really jive with my awareness, which had contradictions. This along with my info ended up, both throwing a monkey wrench into things and in some ways helping to sort out about 4 different Martin MacDonalds. For these comments check under John MacDonell KING ca 1740-ca 1816; Martin MacDonald ca 1748-after 1825; and John Martin MacDonald 1782 - 1858; and Peter Troy MacDonald. There are a number of couples with the same names getting married & having children in the same time period. For instance there are 3 sets of Angus McGillis & Mary McGillis, as well as 3 sets of Donald McGillis & Catherine McGillis as well as 2 sets of John McLachlin & Isabella MacDonald to get mixed up on. Enjoy, So have fun. Here is a list of the Surnames listed in this Version 5, The MacDonald & MacDonells being the biggest contingent of surnames. These are the names this index to version 5 contains. The links do not work. This is for display purposes only. This index, if printed out as is, will be 812 pages. Version 5 of the MacDonald of Loup has over 34,000 name entries as this index shows, will be available on CD in a web card format, accessible with any web browser. Many of the names have either a birth, death date or both. Names are easy to get into this file. Filling in the gaps with seemingly proper documentation takes longer. Some duplication has been eliminated, some glitches corrected. Some still remain to be cleared up. Many entries now have either a baptism, marriage or death record from the local churches. Some may have all three references, some obituaries, some wills etc. Anywhere there is a [ ca ] with a year means that, that year is a rough approximate of the time period when the person lived. Thus, all [ca] references require more specific clarification. These [ ca ] references are always subject to change or float until more accurate dates are found. It is hope that this method will assist people searching, in cutting down confusion of the time period for the many similar names. The Descendants of all of these early families in the Glengarry County area have become interrelated to some degree over the past 2 centuries. They are mixed up in more ways than one. 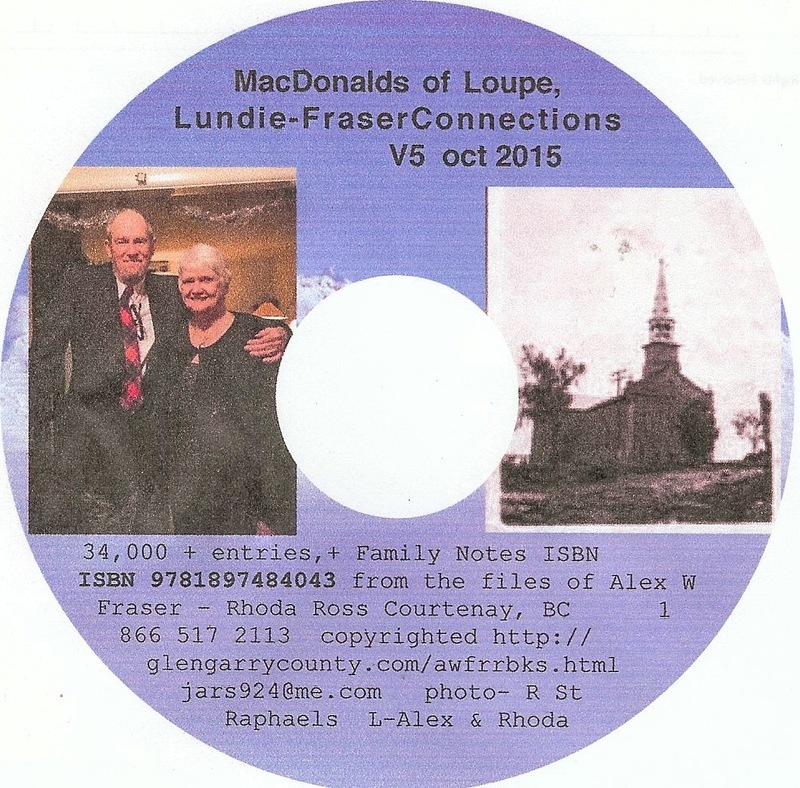 The MacDonalds of Loup, Lundie & Fraser Connections Version 5 is now finalized. This work is an excellent GUIDELINE, not the absolute unshakeable truth on a particular family. Use it as a Guideline with your perspective on your family. Is it perfect, NO!, will it be useful to the viewer, certainly, from a little to a lot. It will raise questions as well as provide answers. Is all the information accurate. That depends on how accurate the information was to begin with. We all know from experience that ages of a person are very seldom constant or given accurately. This work deals mainly with the Macs of Glengarry County over the past 200 years or so and their connection by marriage. There are a number of couples who married as 2nd or 3rd cousins. This aspect along can assist in fine tuning the accuracy of the information included, provided that this info can be deduce, found as well as properly interpreted. There are many many more BMD’s mainly baptisms & marriages that have been added. This has been gleaned mainly for the BMD of St Raphaels, St Finnan’s & St Mary’s some also from St Andrew’s West Church & St Andrews’ Williamstown, 2nd Concession & South Lancaster, as well as St John the Evangelist Anglican [ Church in the Wildwood] BMD, Cote St George, Church on the Hill, Alexandria, etc. also the Glengarry News, Seaway News for death notices and Munro & Morris Funeral home death announcements on web site. There are many CAUTIONS to pay attention to as well. This comes about while dealing with families, marriages with similar names for bride & groom overlapping the same time period. As a result some of these family automatically get mixed up. As I do not know your perspective on your family even when I have to some extent information on your family in this work, if it does not agree with what you are aware of, do not let that bother you as we are looking at similar family aspects from 2 different perspectives. If you are naive enough to believe this can’t happen then you have a lot to learn ESPECIALLY when dealing with the MACS. From my perspective all the names entered in this work are correct, parents and children, which in a number of cases does not mean they are the correct people for that family. People moved around, just like they do today, so lot, concession numbers do not always jive or stay constant. THUS, I am suggesting as a starting point that from the readers perspective they consider, view all this information in this work on My [Alex W Fraser] MacDonalds of Loup, Lundie, Fraser connections as suspect. are all winners and better off on this journey of sorting out our family connections. Every name in this work is connected in one way or another by the marriages involved with any particular family. This work is done in the web card format as in previous versions. Thus access can be done from any browser. The web card format is 235 megs. The family notes folder which accompanies this version 5 of the MacDonalds of Loupe is over 3 gigs in size, has numerous folders with additional files. There are 225 completed questionnaires in various degrees which we collected prior to 1990. In addition the family notes has family charts, photos, wills, and other information on families so listed. Delivery starts January 2016, full retail cost at $179.00, shipping included.